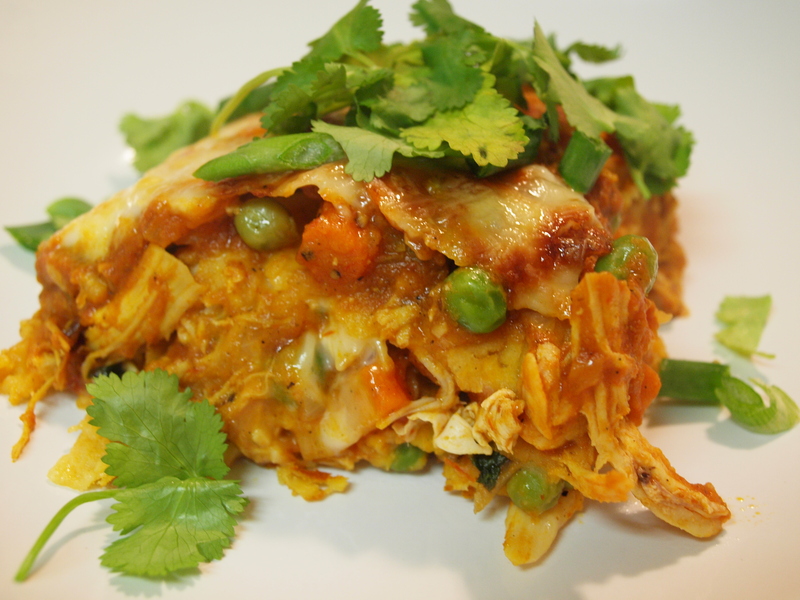 Is there really any reason to mess with the nearly perfect foods of Madras Indian curry or chicken enchiladas? In and of themselves they are quite delicious lil meals, however, I like to mix things up and it was high time these got a remix of their very own. Queue Bollywood/Mariachi mashup song. I love cooking curries, both of the Thai and Indian variety. Frequent trips to the spice and ethnic grocery stores in our area make this an easy feat to accomplish. I think a lot of people believe curries are difficult to make, but I have found them quite the contrary, especially Thai curries which I have a habit of making far too often. Recently I learned just how easy it is to make your own homemade enchilada sauce from Mr. Emeril Lagasse. You can find his recipe here. I couldn’t believe how flippin’ simple and quick it was! Seriously so simple and tastes way better than anything you will get in a can. After mastering my homemade enchilada sauce I got to thinking how great curried enchiladas would be. I have never had them before, but I like curry and I like enchiladas. Sounded like a match made in heaven. We have had a tin of Madras Indian Curry powder in our cupboard for some time and it seems we have still barely made a dent in it (it’s a large tin), although I assure you we use it in our cooking quite often. The tin looks like this. 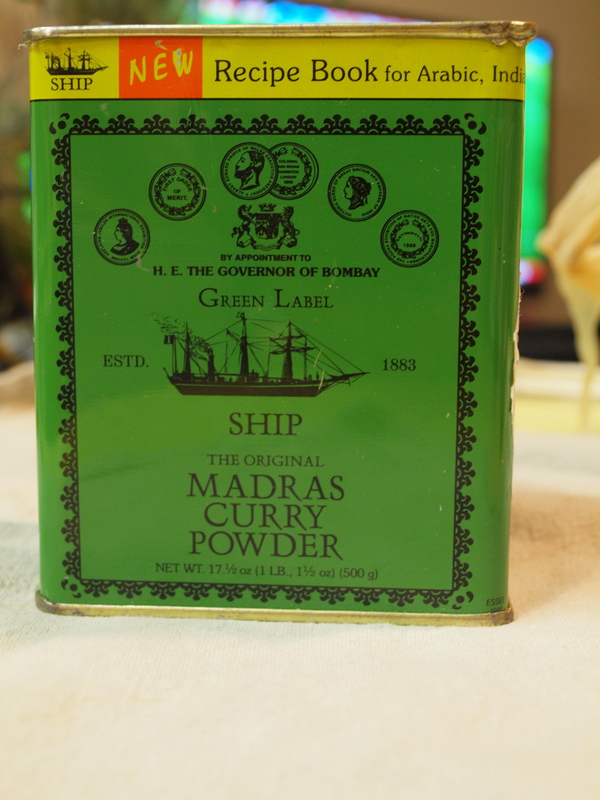 This Madras Curry Powder has the following ingredients in it: coriander, turmeric, salt, fennel, chili, black pepper, fenugreek, garlic, cumin, bay leaf, ginger, cassia. This curry powder had a good mix of all the spices so I didn’t feel the need to add too much to it. You can play around with other curry blends if you want such as vindaloo or garam masala. I have to say that this dish turned out amazing with just the right amount of curry flavor and spice. While it may take a little longer to assemble than most people are used to spending on a weeknight meal, I believe you could make a pan or two of this on a weekend and freeze one for when you need it. The thing that takes the longest to cook is the shredded chicken, which cooks in about half hour. You will notice that I didn’t actually roll my enchiladas in this recipe, that was due to my flub of not taking the frozen corn tortillas out of the freezer to thaw prior to starting to cook. Instead I layered the ingredients which made it quicker to assemble and tastes the same as the rolled ones in the end. For the veggies in this recipe I used carrots, peas and fresh chopped spinach, but I encourage you to play around with the veggies you have in your fridge as I am sure they will taste fantastic in this dish. Now let’s get to messing with the enchiladas, shall we? Or is it messing with the curry? I’m going to break down the ingredients into sections below for each element you have to prepare prior to assemblage in the pan. 2. Place chicken in a pot and fill with water to cover by a few inches. Put on stove top on High heat. Cook for about 30 minutes until chicken is cooked through and is easy to shred with 2 forks. 4. After you have turned heat on onion, garlic mixture to LOW and it has a minute or two to adjust temperature, add in the flour and stir. Cook for 1 minute. (Note: Be sure NOT to burn your flour in this step.) Add in the curry powder and stir. Cook for another 30 seconds. Add the chicken broth and tomato paste and stir until combined. Cook on low until sauce reduces and thickens; about 15 minutes. 5. While curry sauce and chicken are cooking, start on the vegetable blend. Add extra virgin olive oil to a saute pan and heat on Medium heat. Add carrots and cook for several minutes until tender. Add the frozen peas and grated ginger and cook another minute until peas are defrosted. Add chopped spinach and cook until it wilts and moisture is cooked off. Season with a pinch of kosher salt and fresh cracked pepper. 6. Once chicken is cooked through and it easily shreds, pull it out of cooking water and onto a cutting board. Using two forks, shred all of the chicken. Retain about 1/2 cup of the cooking water in the sauce pan, drain rest off. Add the shredded chicken back into pan with remaining water. Add 1/2 cup of the curry sauce to chicken and combine. Cook on Low a few minutes for chicken to season in the sauce mixture. 7. Add a ladle or two of the curry sauce to the bottom of the 9″ x 13″ baking dish and spread around bottom of pan. Place 6 corn tortillas on bottom of baking dish and spoon more sauce over them, spreading to cover. Alternate each layer with the cheese, veggie blend, shredded chicken (be sure to strain the chicken out of the sauce it is cooking in, so it doesn’t get too watery), curry sauce and tortillas. Be sure to finish the final two layers with sauce and then cheese. 8. Place into oven and cook for about 20 minutes until cheese is melted and bubbly. When finished take out of oven and let sit to cool for a minute or two. Slice, garnish and serve. 9. Enjoy and let me know how you liked it! Posted in Affordable Eats, Palate Pleasers and tagged baked enchiladas, bay leaf, Black pepper, Bollywood, carrots, chicken breast, chicken broth, chicken enchilada recipe, chicken enchiladas, chicken vegetable enchilada, chili, chopped spinach, cook, coriander, corn tortillas, cumin, curry enchilada sauce, curry enchiladas, curry powder, curry sauce, Emeril Lagasse, enchilada recipe, enchilada sauce recipe, extra virgin, extra virgin olive oil, fennel, fenugreek, fresh ginger, garlic, ginger, indian cooking, Indian curry, Indian curry sauce, Indian enchiladas, indian food, Indian Mexican fusion, indian recipes, kosher salt, Madras Curry sauce, Madras Indian curry, Mariachi, mexican food, Monterey Jack, peas, shredded chicken, tomato paste, turmeric. Bookmark the permalink.